Scotty (Simon Pegg) and Bones (Karl Urban) are stranded on Starbase Earhart, a remote outpost just outside of Federation Space, after the Enterprise is destroyed by an unknown force of ruthless aliens. Halfway into their five year mission, they must now face off against a new and unexpected villain that they quickly learn has a storied and powerful hatred of the Federation and all that it stands for. The Enterprise's mission was to explore strange new worlds and seek out new life and new civilizations. In Star Trek: Beyond our heroes find themselves on a strange planet where members of the crew have been taken hostage by a ruthless villain named Krall (Idris Elba). 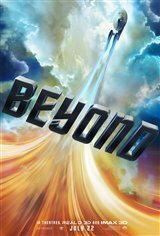 It's up to Captain Kirk (Chris Pine) to rescue his crew and prove that the Federation's belief in unity is not a weakness, but a strength.